As you browse through the reviews on my website and all the other snippets of information I have added, you will notice I often refer to induction compatible cookware. In fact, I have gone as far as explaining why you should have specialist cookware, and how you can check if your current pots, pans and skillets will work with induction. After all, if I can help you avoid spending money you shouldn’t have to that’s what I aim to do. However, it could be that you have cookware that’s been with you for years and has seen better days. It could also be that you’ve just started out in the world of (induction) cooking, and want everything to be just right. It could even be that you know someone who has recently invested in an induction cooktop, and you want to give them something really special as a gift (not hinting kids!). Whatever reason it is that you’re looking for a new set of cookware, I’ve added a small selection of what I think are the best I’ve come across so far. Considering a Completely New Set? Aside from the fact this set of cookware has been designed to work with induction cooktops (among others) because they’re stainless steel, they look really good. 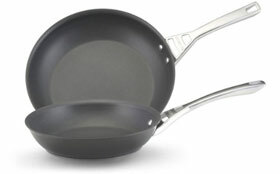 – 8 and 10 inch frying pan. – 3 Quart sauté pan with a handle helper and lid. – 2 and 3 Quart saucepans with cover. – 5 Quart casserole pan with cover. – 6 ½ Quart saucepots with cover. This cookware has a unique 3 layer construction, meaning the manufacturer has cleverly sandwiched an aluminum core between two layers of magnetic stainless steel which helps to give perfect results every time. They’re dishwasher and oven safe (up to 550F), and you can even pop them in the freezer. The handles may look like they get hot, but that isn’t the case. Oh, and you also get a lifetime limited warranty. If you have an induction cooktop that has less burners than most, but still want to get the best from your cooking, you may want to consider the Gourmet Chef Induction Ready 7-Piece Cookware Set that comes in black. Considering most cooktops like this have a black ceramic surface, these will blend right in. – 1 Quart covered saucepan. – 3 Quart covered saucepan. – 5 Quart covered casserole. This set of cookware has a heavy gauge aluminum core which helps to make sure heat is distributed evenly throughout the whole pan. The handles are made from silicon which will never get too hot to the touch, and all pieces come with non-stick surfaces. What I like most about this set of cookware is the fact that the lids are made from tempered glass which is heat resistant and clear. This makes it easier to see how your dishes are progressing. One thing I have to add here is I read a few comments that not all pieces are 100% induction ready, so it may not be the best choice if you only use induction. 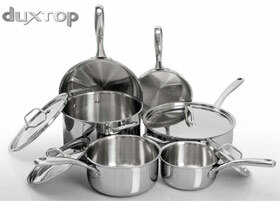 What would you say is the most used piece in your set of cookware? I know what my answer would be, and that’s the skillet. The Circulon Infinite Hard Skillet Set comes in a twin pack. One fryer is 10” and the other 12” which makes both of them perfect for cooking anything from silver dollar pancakes to searing your favorite steak or even cooking a meal for one. The hard anodized aluminum used is twice as hard as stainless steel which means you can cook up a storm in no time, and these skillets will ensure even cooking every time. The manufacturer has used the latest in non-stick technology and proudly announces the formula they have used will outlast any other out there. They’re easy to clean and you can even pop them in the dishwasher. Plus, I can’t forget to mention you can put them in the oven up to 500F. Finally, I understand that some people will have spent their entire budget on the induction cooktop of their dreams. So, this means no more room for additional cookware. However, all is not lost, I came across the Max Burton 6010 8” Induction Interface Disk which I think could solve your problems. First of all, it doesn’t matter if your cook top is built-in or portable, this interface will do the trick. It comes with a really useful handle that’s heat proof and easy to grip, and it’s made from stainless steel (perfect for induction) and measures 8 x 15” and is ½ inch thick. Plus, it will work with pretty much any type of cookware. There are a couple of things to consider though. It has been noted the surface of this interface disk does get hot (obviously) but unlike your cooktop, it will take a few minutes to cool down. 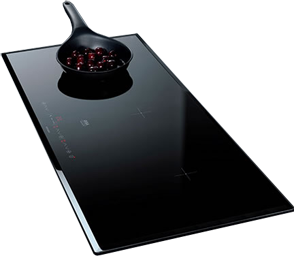 You also have to consider the performance of your cook top might be reduced slightly simply because it has another “element” to deal with. Personally, I think that if you have a mix of induction and non-induction ready pots and pans, this is the perfect solution so you can use them all.